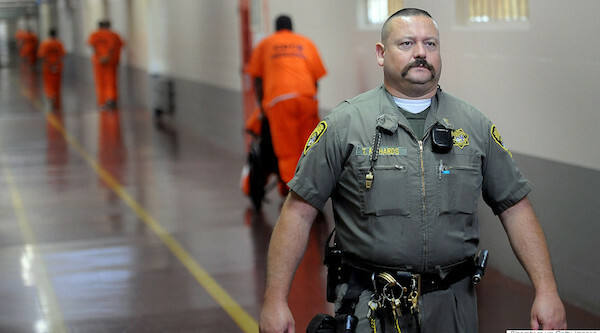 Correctional Officer T. Richards stands watch at Deuel Vocational Institution on Thursday, Oct. 11, 2012, in Tracy, California, U.S. Photographer: Noah Berger/Bloomberg News. This week’s article (Click HERE) focuses on the shortage of corrections officers in the State of Texas (although this issue is one that is effecting all States as well as the US Federal Bureau of Prisons). Wisconsin is also dealing with this issue (see May 2018 article by clicking HERE). The WI article is interesting as it alludes to 4 prisons as being particularly hard to keep staffing (I’m assuming these are the maximum units). Lots to address with this problem. What do you see as the main issue and what are your suggestions for improving the issue? The issue surrounding the shortage of corrections officers is parallel to the teacher shortage in Wisconsin. Lack of respect from other professions, high stress, low pay, and dangerous jobs (depending on the school) all contribute to high turnover and low retention. Public opinion and lack of respect for corrections officers (can’t make it as police officer) and teachers (can’t make it in a “real profession” or “those who can’t do it, teach it”) do not provide encouragement for future generations to pursue these professions. Suggestions to improve retention include: improved funding at the state and federal level to provide increased pay, improved healthcare and retirement options, additional training and support, and prioritizing safety and mental health concerns. Most importantly, people want to feel respected and safe in their work environments. Imagine going to work in the morning and not “knowing if you’re going home at the end of the day” as stated by one corrections officer. Valuing employees is extremely crucial to retaining employees. One way to value employees is to train them on a facility by facility basis on the needs and expectations of that facility. Mentoring new corrections officers and providing the “institutional knowledge” of veteran employees will improve retention. Another suggestion could be creating support groups, peer mediators, or restorative programs in which inmates could participate in changing the climate of the facility. Although, this suggestion would not be appropriate for all types of facilities, it could be successful in creating a less hostile environment. Many schools have experienced increased respect and an improvement in the overall school environment after students’ perspectives were valued. The main issue is that the pay vs danger ratio of the job is not high enough. The danger of being a correctional officer, especially in maximum security prisons is high and the salary is simply not enough in order for people to risk their lives every day. As one prison guard said in the Wisconsin article, “you never know if you’re going to make it home at the end of the day”. Lots of guards have a family and would not like to risk their lives for the sake of them. I think another main problem is that there is an overcrowding in the prisons and the more prisoners there are, the more they can get each other riled up. I think in order to keep correctional officers numbers up is to offer more of an annual salary like the Texas article said. I also think there needs to be an separate analysis for each high violent rate prison in Texas and Wisconsin. Although this is time consuming, it might be worth it in the end because it will hopefully assess on more of an individual level what each prison needs to eliminate or improve the situation better. Simply saying oh things will change is not good enough and that is why I think there needs to be more of a separate focus because each prison has different problems in relation to violence and danger for the correctional officers. The United States needs to lower the amount of people they are sending to prison. There is a lot of issues with this problem. I feel like the main ones would be first, how dangerous the job really is. They have to keep the order and security of the whole institution, other fellow correction officers, inmates, and themselves. This could cause a lot of stress in in a person. This also includes the fact that they do not get paid as much as they deserve for the important job they do keeping the safety and security. Also, like the article states, there is not much incentive for the correctional officers to have a better career and job opportunities within the correctional system. They may feel like this career path is not the best, they are going to think this job is going to get them stuck in one place, doing the same thing, earning the same wage for the rest of their lives. My suggestion for improving this issue would be solving the problems listed above. First, it will be a good idea to have programs for correctional officers where they could get help managing and dealing with the high stress the job represents. Second, it would really help a lot if their work would get recognized by them getting a higher wage, they are the ones that keep the criminal population controlled. Finally, incentives of any kind in order to help correctional officers further their career and have a higher job title. One of my closest friends worked as a correctional officer in a low-security prison for years–he now works in the trades. He could not handle it. Honestly, he thought that working in corrections allowed you to help people, instead, he watched as human beings were allowed to waste away. He saw how criminals, though all being in prison for a reason, were treated as sub-human. Did he condone their crimes, no, but he just could not wrap his head around how men, who have been in prison for drug charges for decades, were allowed to simply be forgotten? That emotional turmoil on top of ridiculous hours with limited overtime, low pay, and crap benefits. He couldn’t handle it. I honestly think this toxic mixture is also the reason Wisconsin and Texas prisons struggle to keep good COs. I think it is crucial that the climate in prisons need to change. I get a lot of the prisons mentioned in the articles are maximum security, meaning the worse of the worse criminals are “housed” there; however, the hostility that exists in prisons has to be changed. I think that because society sees criminals as the lowest in the of low within the humane species, that no one is willing to invest appropriately in prisons–that means those who work in the prisons have limited resources to effectively do their job and be appropriately compensated. Correctional officers need to be paid more, have better training, be given stronger resources, and have benefits that allow them to stay healthy and happy (maybe they will actualy be career long COs in one place). There is many problems with this. Not enough people want to work as a corrections officer. It is a dangerous position and some would argue that the pay is not good enough for what they go through in this occupation. This job is also high stress. It may be hard for some people to separate work life and home life and this could affect how they perform at work and also their relationships with their family. There can be different ways to go about solving this issue. One way that comes to mind is recruiting people to work in prisons. Most people just hear negative things about this profession and this causes them to not want to work there. They need to recruit strong people who can handle this type of job. And then, I know this is probably unlikely, but I do think they deserve to get paid more. For what they go through they should be making more. And this could lead more people to want to work in this profession. And then the last thing that comes to mind when thinking of a way to solve this issue is providing resources to the people who do work there. They need therapists, tips about balancing work and home life, support groups, and things along those lines could help tremendously. In my opinion, main issue is correctional officers’ stressful working conditions. Like the officer in the article mentioned, they never know whether they will be able to go back to home safe at the end of the day. They are basically surrounded by criminals at work either in low or high security institute. Their mental health is always at risk, but it rarely gets taken care of. Even the wage is not considered high enough if you consider their dangerous working environment. Especially, due to shortage of correctional officers most of them are working overtime and it is likely to lead them to change their career. Article also mentioned that the amount of money that they have to pay for benefits had increased. When you consider all these factors, there is nothing weird with having low number of correctional officers, because, who would want to become one and keep it as their life time career when they are not treated well enough? There are two suggestions to improve the status of the issues. First, and mostly importantly there should be an increase in government fund for correctional officers in general. Then it can better their work benefits, wage, and working conditions. Maybe letting them talk to a professional counselor regularly can help them a lot with their mental health as well. This, in my opinion, would solve many problems itself. Secondly, I think there is a need to educate those who wishes to work in law enforcement about this career. Not just teaching students regarding the dangerousness and hardness of the job, but also how it can be rewarding and beneficial to their life. I believe the main issue contributing to the high turnover rate of correctional officers is lack of career development. This is a high burnout profession and the article states that in Texas, wardens can make 10 straight days of 16 hour shifts mandatory which isn’t sustainable. As nice as the $4,000 or $5,000 sign on bonuses are, I think this money along with the money they spend on continuously training new correctional officers would be better spent on providing programs that allow the current correctional officers to work their way up. Starting on the front line is fine but it is essential to their physical and mental health to be able to move away from the front line into supervisor or administrative roles. Tuition reimbursement and/or student loan repayment would allow them to earn the certifications required for these positions. Mentoring with someone in a supervisor or managerial position would also be beneficial and I have heard of companies that establish internal career development programs too. Working 16 hour shifts could be a barrier to all these suggestions and job sharing could be a good option to overcome this. The shortage of correctional officers is a major problem. The high-stress nature of the job itself might be turning people away, as noted by the officer in the Star Tribune article who remarked about not knowing whether or not you’re going home at the end of the day. In addition, the lack of advancement opportunities for the officers is an equally big concern. The San Antonio article notes that the starting salary of $36,000 is capped at $43,000 after just seven years. Solving these issues won’t happen overnight. A good start would be to increase resources available to those working in corrections, like advancement programs that allows officers to gain new skills and advance their careers within the correctional system. This would make it easier to recruit prospective correctional officers and make it a more appealing position. I recently took a technical writing class and did an entire project on the turn-over rates of correctional officers. Employees give many reasons for leaving correctional agencies or companies. The top four responses related to retention were demanding work hours and shift work, inadequate pay and benefits, stress and burnout, and the company hiring others who are not suited well enough for the job. Other research has identified a number of factors relate to the retention of officers. This includes supervisors who fail to treat employees with respect, properly recognize, or show interest in them. Noncompetitive low pay. Inadequate work/life balance, worker overload, stress, and burnout, and a issue with what people are looking for in a job and in growth opportunities. According to many professional law enforcement officers, it can be a very stressful job being an correctional officer within a detention center facility. Employees come to work unhappy and very tired. Developing different strategies to reduce the turn-over rate of correctional officer may help to relieve workers stress could help make the work environment less difficult. By applying new strategies to training, higher salaries, and applicant screening are just a few of the many ways to decrease the turn-over rates of Correctional Officers. 1. The incentives are a good way to promote getting officers with the $4,000-$5,000 sign on (educational or personal), but what about the state or federal government pushing for better benefits, the articles the barely if not at all cover the benefits that officers receive. I gentleman I know that works in the Appleton area prison, before he was employed there, the last prison offered very little health benefits. If something were to take place at the old prison, he would have to pay partly out of pocket for injuries that he sustained from inmates. 2. Given shorter man power, address new SOP (standard operating proceeder) conducting new rules that help compensate for low guard personnel. Prison populations severely outnumber guards, the best way to maintain a better control and personal safety (this will sound radical) but have officers walking the grounds or corridors, (like the officer pictured above) with non-lethal dummy rounds. Those SOB’s will hurt like holy hell and can be a controlling factor in a prison. 3. Finally, I’m going to echo what has been said already, fair pay to help compensate for the conditions that guards have to face for only $43,000 a year cap? have to deal with inmates 24/7, every single second, of every single day. Yet their jobs constrain them to a wage that will barely support them, let alone a family. The main issue here seems to be the high stress intensity of these jobs and the fact that they are way underpaid. In the article from Texas we see that the salary is capped off at 43K – that is ridiculous. Not knowing if you get to go home at the end of the day because of shortages is not only stressful, but if you continue to work overtime, the body just gives up and burning out could be inevitable. Inmates are in maximum units for a reason and if something goes down and these officers are provided with heath benefits that are not sufficient, then what? If taxpayers paid so much money in overtime, why can’t we just offer better salaries for less hours and therefore make these positions more attractive? There are many issues with the criminal justice system in the US. We seem to incarcerate more and more people but don’t have enough staff to oversee them. Something is wrong with that equation. Higher pay, better benefits, access to education (to be more efficient on the job), counseling, and other forms of mentoring, and room to progress in the career (even after seven years) might eventually make jobs in prisons more appealing. I believe one of the biggest issues with the shortage of corrections officers is the hours and pay. These individuals are being forced to work in dangerous environments around convicted criminals’ day in and day out, with little pay and little respect. I believe another impact as to why there is a shortage is just the job itself, being surrounded by a depressing toxic environment every day wears down on you as a person. I can imagine that this job has a huge impact on one’s life outside the job, working up to 16-hour days up to 10 days in a row is a significant amount of time spent away from families. Essentially there is no family time, let alone time for oneself. Doing a ride along with a local sheriff earlier this year he mentions that if he were to somehow get place working the prison instead of working out on the streets immediately. There is for sure a respect issue that also comes along with being a corrections officer. Many times, corrections officers have just as much training as a law enforcement officer but are not considered part of that family. Suggestions for improving correction officer retention, I would start with hours worked and pay. At the end of the day a corrections officer is still just a job, not a lifestyle. There needs to be something implemented that will bring more individual into the field to lessen the lack of officers. Once prisons/jails have enough correction officers they can cut hours back to a normal 40-hour week with optional and not mandatory or voluntold overtime. That would boost morale and not make it so terrible to work. Bumping wages would also significantly increase the amount of people interested in the field and retaining individuals as well.